The Museum of Fine Arts Boston is much more family-friendly than one might think, and has an extensive collection of Asian artifacts, including Chinese painting and calligraphy, Himalayan artwork, prints and postcards, and Japanese arms and armor. A dimly lit room filled with Japanese Buddhist art is a quiet place to contemplate the meaning of life (or just give your kids a chance to chill out). To get there, take the T -- the Green Line's "E" train takes you right to the door. The museum is open from 10:00 a.m. to 4:45 p.m. every day, and stays open until 9:45 p.m. on Wednesdays, Thursdays, and Fridays. Admission is free for kids under age 6 (strollers are allowed, baby backpacks are not but can be coat-checked), kids age 7 to 17 are free on weekdays after 3:00 p.m. and on weekends and school holidays ($10 at other times), and adults are $22. 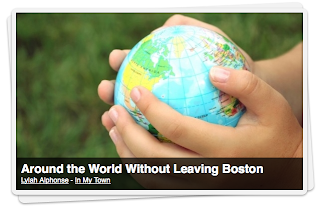 Read the rest here: Around the World Without Leaving Boston.